In a distance of approximately 60 km southeast from the town of Heraklion you will come across to maybe the most relaxing area in Crete.The area is Kastri and the house is located in a superb place with unlimited sea view. The sandy beaches of the area are a magnet for visitors especially for those who love quiet holidays. This villa has 3 spacious bedrooms and a big living room with kitchen.In a walking distance from the house you will find some taverns and restaurants next to the crystal clear waters that are really worth trying. The sea surface is usually calm while it is ideal for snorkeling and spearfishing.Families or friends will appreciate the brand new interior with all the modern amenities while lunch or dinner can be served on the terrace with view to remember.GKR199 is a neighbor house. This beautiful modern villa is made from brick or stone and was originally built in 2014 and refurbished in 2017. The agent has rated it as a four star property so it is a well-equipped villa with above average furnishings. It is also great value for money. 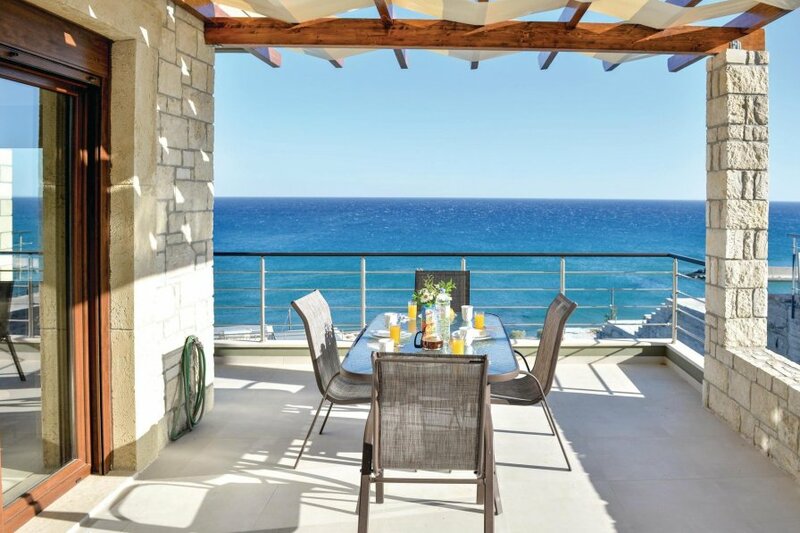 This villa has beautiful panoramic view over water and is located in Crete, 59km from Heraklion. The nearest airport is 59km away. It is set in a very convenient location, just 40 metres away from a sandy beach. There's also a restaurant only 150 metres away. The villa has free wireless internet. You can also park on-site at no extra charge. The villa is well equipped: it has a refrigerator, washing machine and dishwasher. It also has a shared barbecue and some garden furniture outside.